These quality braided rugs and made of 100% Jute. Easy to clean. 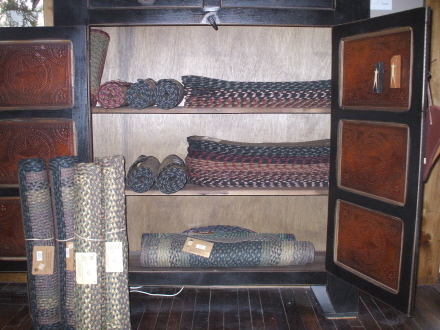 I carry 8'3" x 11'3", 5x8 and 4x6 area rugs, 2x8 runners, table runners, stair treads, chair pads and table trivets. Many colours to choose from. 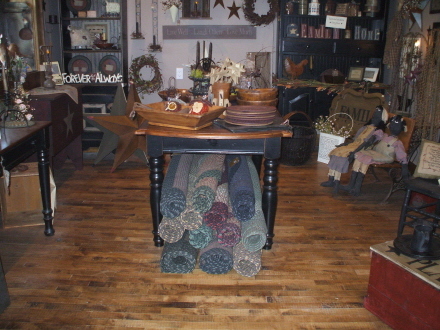 Just received a large order of 8x11 and 5x8 braided jute rugs in an assortment of colours. As seen in the Country Sampler these tobacco cloth panels come in black, red or mustard stars. Just arrive, a large selection of Jute Area rugs from two different companies, new colours. These panels are handwoven in Pennsylvania. Purchase by the Panel - size is 46" x 72") Tie-back included. 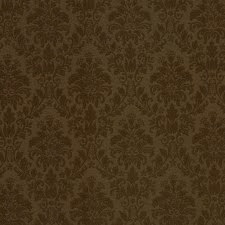 Also available in black/linen & brown/linen.